Robin White awaits the start on the second day of the Death Valley Warmup ride. 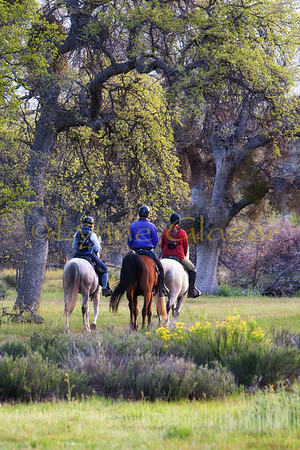 It's as if there weren't many horses milling about behind them, such a nice private moment. Many forms of containment are in use at rides, and many still tie to the trailer. 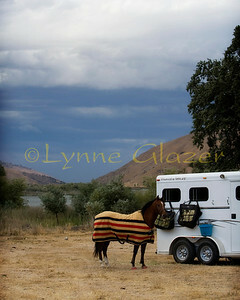 Castac Lake in the background at the first Tejon Ranch ride. 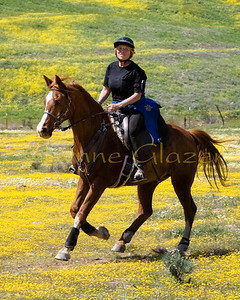 Mustang Lee and owner Rebecca Florio school in dressage when not on trail. 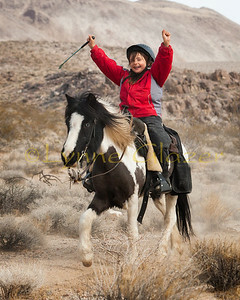 Lee has finished the Tevis ride. 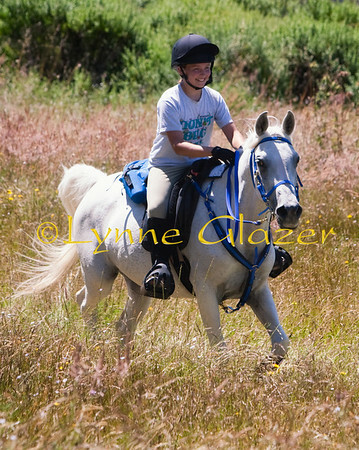 Rebecca's other endurance horse is an Arabian mare, who has also finished Tevis. Both do multi day rides as well. This shot is from the Tejon Thanksgiving ride, with Castac Lake in the background. 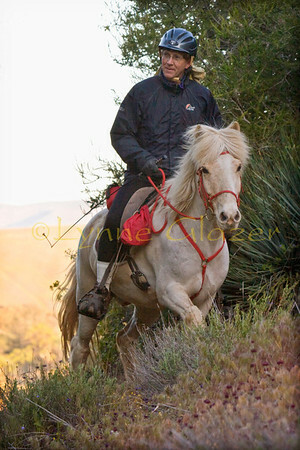 Becky Lange and her phenomenal Kentucky Mountain Horse Mocha Jack, on the second day of the Cuyama Oaks XP in 2010. I believe he's finished Tevis twice, once just out of the top 10. Lots of multi day wins and BCs. Becky is wearing tights by http://www.thetightslady.com. Comes every year with her mom and another kidlet, and they do the 25 miler. Pony power! DVE Warmup 2012. Brandon Reed and Hawk vet in for Tevis, and finished the ride. Karen Frederickson and "Murphy" (MMR Pyro), 2011 winners of the Pardners award. Murphy has also earned the "Perfect 10" award sponsored by Joe Long: 10 firsts, BCs, 10,000 miles, at least 10 years in the sport (check). They're also a Decade Team (10 years of competitions together). 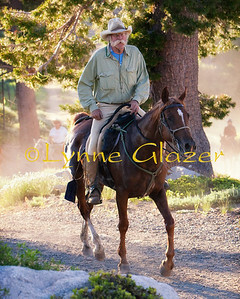 Hall of Fame rider Crockett Dumas on one of his great mares. 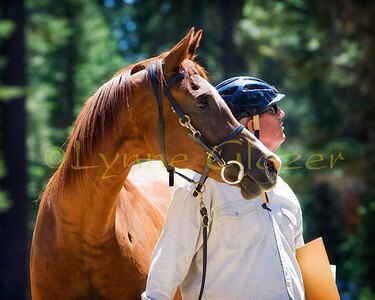 Dan Schafer and Ray of Hope pause on the way to exit from vetting in. Lots of couples do endurance: Les and Jill Carr. Yes, Les has headphones on (books on tape). He's on his Hall of Fame horse Tulip. Jill is on Walker the Mule. 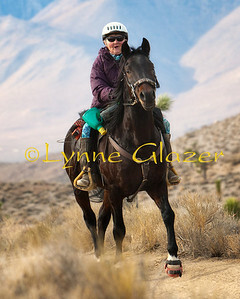 Distance riding can be so very social or not at all: Mary Anne Turner heads to the finish line at the Death Valley Warmup. Multi day rides have many of the large living quarters goosenecks pulled by diesel pickups or even Freightliners. 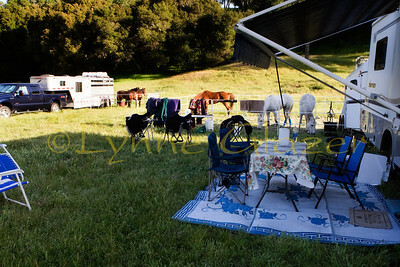 Most riders began with a two horse and a tent, and leveraged their way up as the addiction took hold. 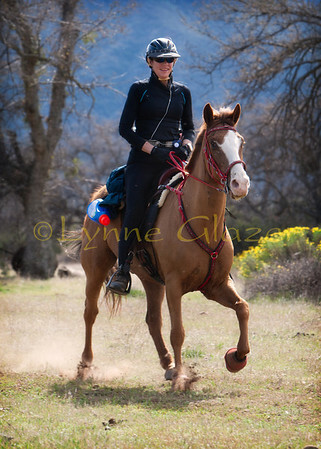 Susan Garlinghouse and grade TWH John Henry have been successful at the multi day rides, and recently won over all BC and fastest time at the 2012 Cuyama Oaks XP. They're at the finish line of the first day, a 55. 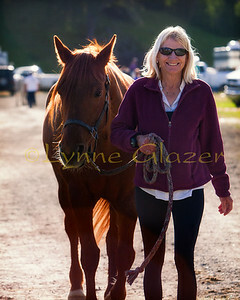 Michele Roush DVM and her accomplished Standardbred-Arab cross PR Tallymark take a break in Pescadero Creek during the Swanton Pacific 100. Tally has over 3,000 miles and 11/11 100 mile completions. The Fisher-Bischoff clan, at the Bar H ride. They came from Colorado to ride and visit Disneyland! Carolyn Tett's daughter warms up before Mendo. I think that's her dad on the mountain bike. 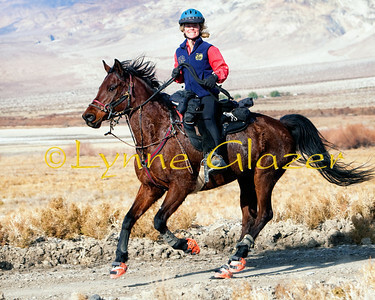 High mileage rider Karen Chaton and Pro Bono on the third day at the Death Valley ride. 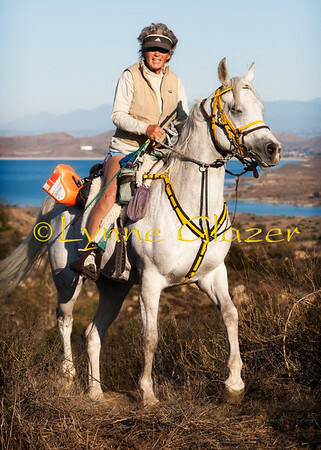 She has over 30,000 miles, and did 3600 miles in 2011 to win the national mileage championship with Bo and her decade horse Granite Chief. 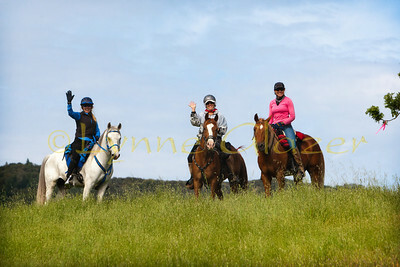 Lari Shea hosted us at her ranch for the inaugural Mendo Magic ride. I think she's on Indy. 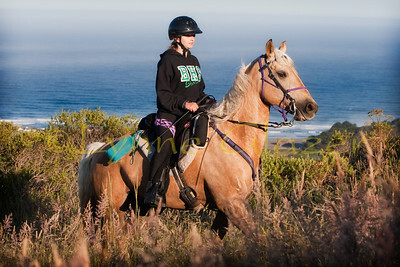 Lari owns the well-known Ricochet Ranch riding vacation outfit. 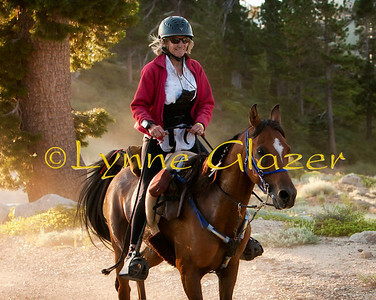 She has lots of endurance accomplishments plus taught seminars with Kerry Ridgway DVM on the Tevis Trail for years. I never got to do that trip and always wanted to! She's also organized riding trips to Africa, South America and India. Barbara White has earned 31 Tevis buckles, the record holder by a wide margin. She's riding Dayna Weary's Cricket on this one. 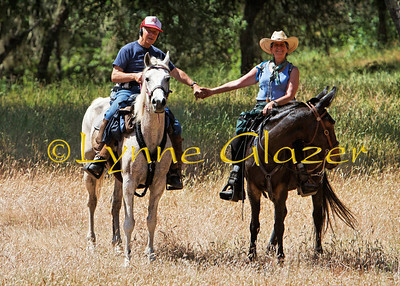 Rick and Suzanne King ride through the western town at Paramount Ranch during the Malibu ride. He's on Rebecca Florio's mare Kay (Ready Set Go). 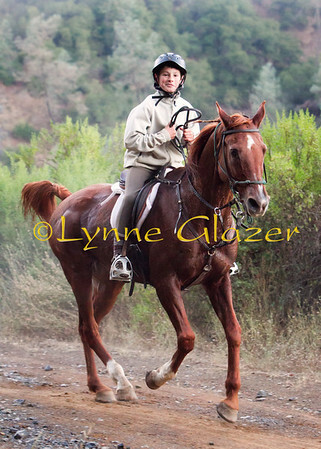 Suzanne is on Cynthia Binder's QH-Arab Orion. Orion has 500 LD miles and has been the first mount for many. Orion's other job is as a upper level dressage horse! 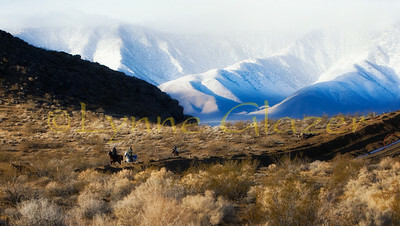 Riders flanked by the Eastern Sierras as they ride along a natural gas pipeline project at the Death Valley Warmup 50. Tactical parking, blocking the western sun. In the dry west, we aren't usually parked on a pasture! 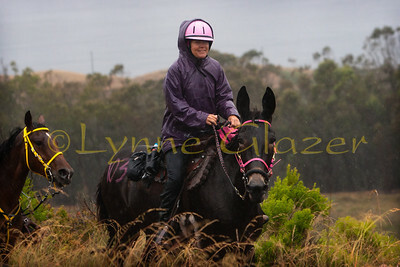 Erin Strand and her mule tough it out at the Montaña de Oro 50, which was cancelled due to hazardous trail conditions within the hour after this photo was taken. Morro Bay would have been visible in the background without the rain and fog. 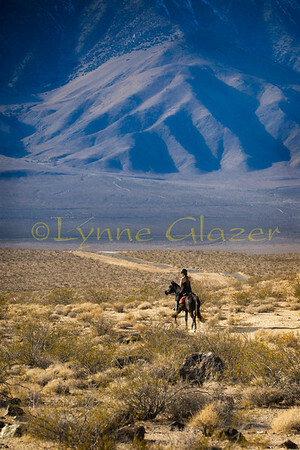 Carlos Siderman and his American Saddlebred at the 2012 Death Valley Warmup. 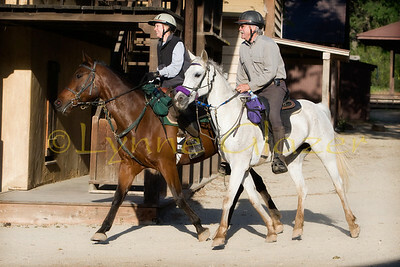 Carlos and Lisa Siderman have several ASBs, and it's fun to watch their various gaits. 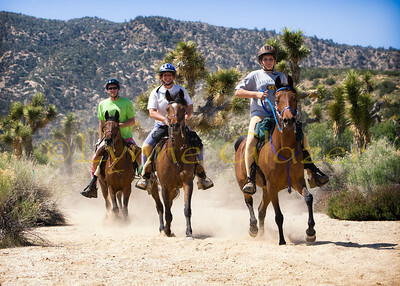 The Low family at the Crazy Coyote high desert ride, their son's first. Having fun in the apple orchard at Mendo Magic. Suzy Kelly at the Bar H ride in 2012, she has more wins than anyone except for Christoph Schork. I believe Seiichi Hasumi did his first ride at 60ish years old--the 2004 Tevis, with the original goal of 10 finishes which he related as we sat next to each other at the awards banquet. He's finished 7 now, and I think he's also got top ten aspirations. Barbara has a dunk in the American River under the Swinging Bridge, as Cricket takes a long draught. 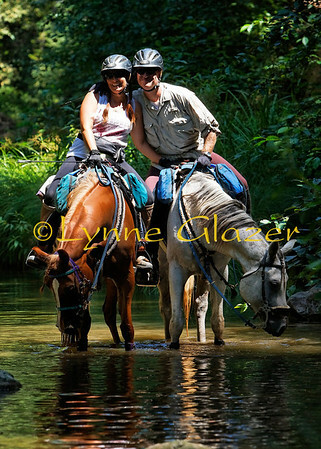 Rene and Gene Norris at the Swanton Pacific ride, as Diva and Skylar look suspiciously at the water. Riders begin the first day at the Cuyama Oaks XP, a three day Central California ride on private land that fills up every year. Posing for a photo--top of the world, Ma! Lost Padres 2 day ride, morning of the first day. 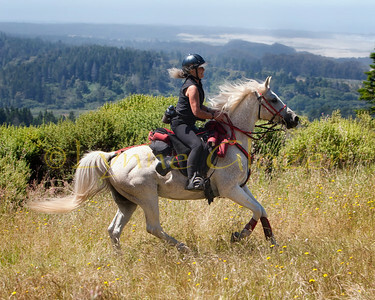 Magali Bastin and her Friesian, Harley, on the inaugural Mendocino Magic 25. My choice for EN cover models from this ride. 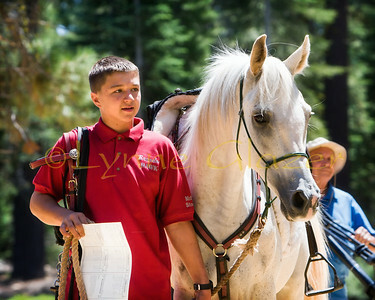 Harley won the "Horse Excellence" award for best-conditioned horse. 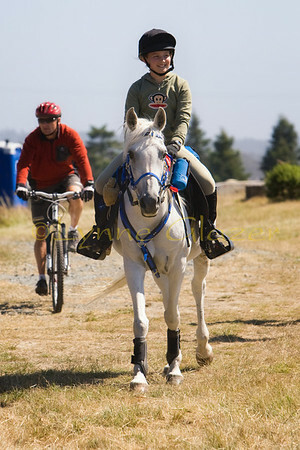 A good looking gaited beast at the inaugural Mendocino Magic ride. 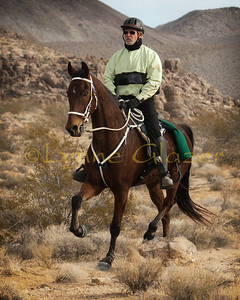 Barack rides the Tevis! They finished although he had to switch sponsors because his mom's horse was pulled. 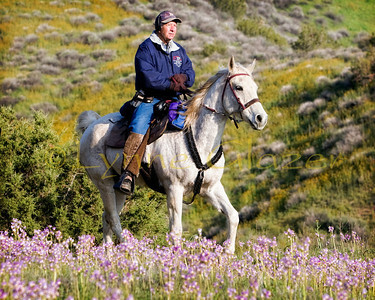 Les Carr and 20,000+ mile Morab Tulip on the first day of Cuyama in the shooting stars. Cheri Briscoe and 3000+ mile stallion Thunder's Echo, son of the Hall of Fame horse DR Thunder Bask. They finished third in the Jim Jones stallion mileage championship in 2011. DVE Warmup 2012. Jim Jones winner for 2012! 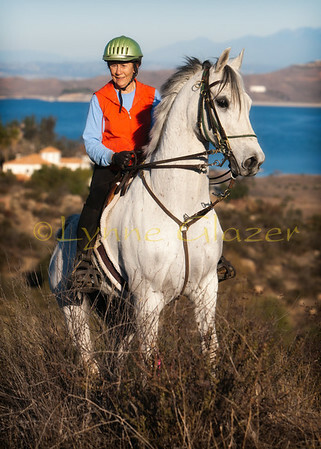 Eloise did her first endurance ride at over 60 years of age--as a Grand Prix dressage and jumper rider, you'll note her use of the double bridle. 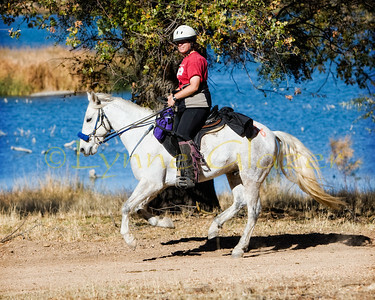 Taken at the 2012 Bar H ride, with Lake Mathews in the background. 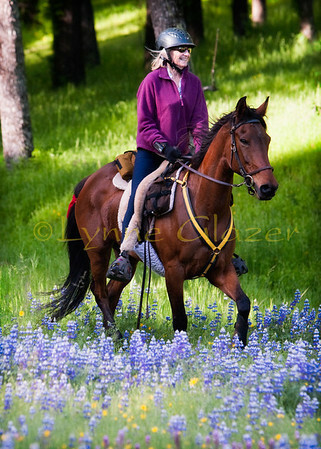 Barbara rides in the lupines during the second day of the Lost Padres ride. 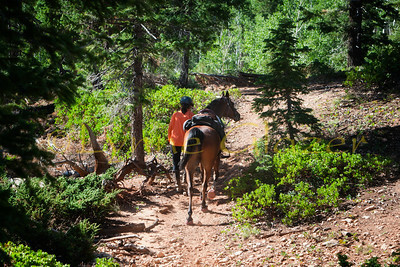 Nannette Young and Wizard stroll the rim side trail on Bryce/Paunsagaunt 2011's first day of 5. Riders can opt to do any or all days, or ride for "Duck miles" which count for club awards only. Details at http://www.xprides.com. If you enjoy going further, faster--distance rides are probably for you. 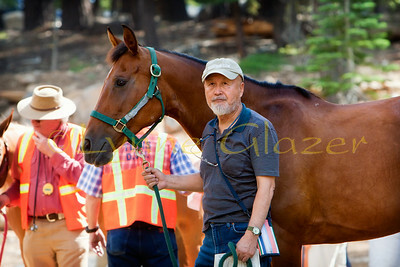 Participants have horses of all breeds, though there's a preponderance of Arabians and crosses. 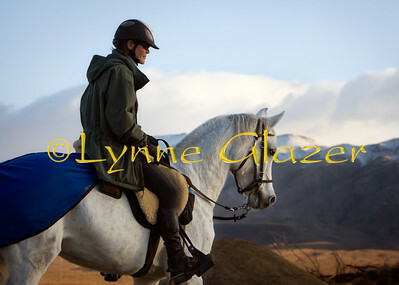 This is John Parke and his Icelandic Skoldjur. 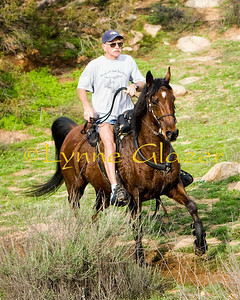 His Remington is the record holder for gaited breeds, at over 11,000 miles. 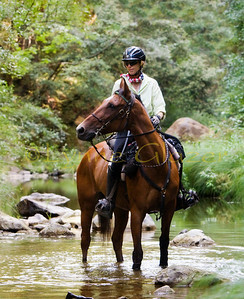 Melissa Margetts and her Paso Fino Cabo take a break in Pescadero Creek during the Swanton Pacific ride. 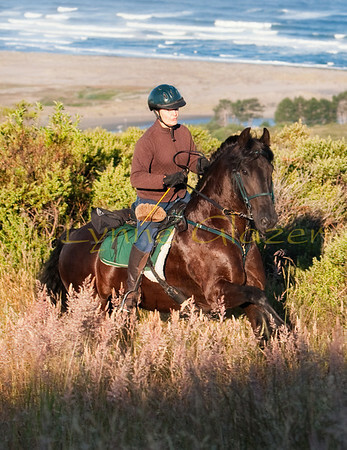 Cabo has finished Tevis at least twice, and is the only Paso Fino to have done so. 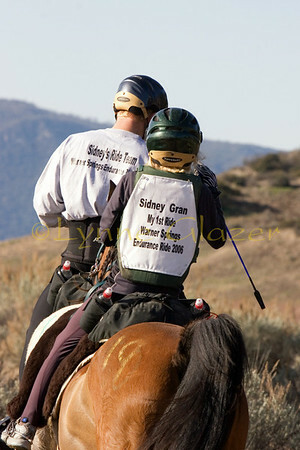 Distance riding is a family sport: Bryan Gran made sure everyone knew it was Sydney's first ride, even if the printer did misspell her name. Sydney is now a high school junior, time has surely flown! 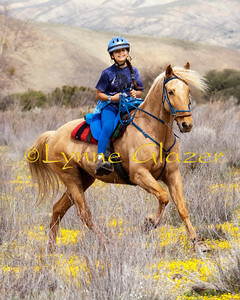 Kadee Felton at the Cuyama Oaks XP. Hall of Fame rider Dave Rabe has over 50,000 miles. A memorable day for him at the Bar H ride. Christoph Shork has won more first places than any other rider. 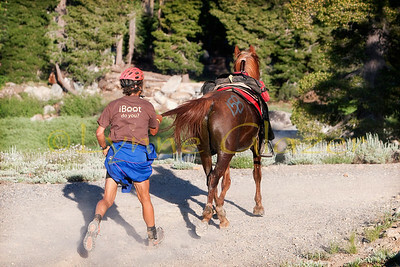 Here he's nearly to High Camp at Squaw Valley ski resort during Tevis. 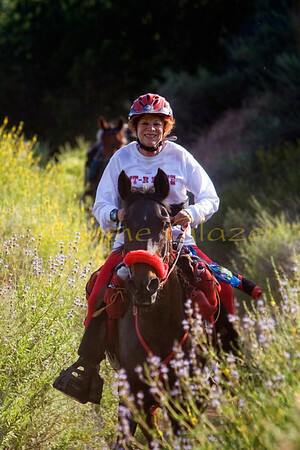 Susan Friedman is a retired teacher, and was also late to the sport--she mostly top tens and has made up for lost time! 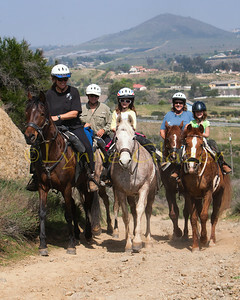 This was taken at the last Malibu ride. Barbara leading Canadian Brooke after the Lost Padres ride.